The Foot Lab in Edmonton, AB specializes in custom orthopedic footwear, custom inserts, orthotics and footwear modifications. 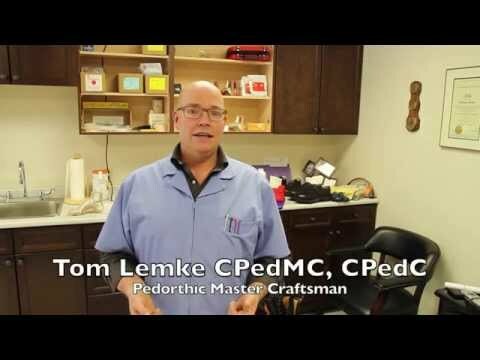 Visit Tom Lemke, our Certified Pedorthic Master Craftsman if you require custom-made shoes, custom insoles or other orthopedic footwear to improve posture, relieve pain or improve balance. Whatever the reason you need custom-made footwear, The Foot Lab can help. If you’ve had trouble finding properly-fitting shoes because you have hard-to-fit feet, get comfortable with a pair of made-to-measure, custom shoes. The Foot Lab in Edmonton makes sure your shoes fit exactly as they should, whether you have very large, small, narrow, or wide feet, and even in the presence of a bump or other non-typical foot shape. Whatever the reason you need custom footwear or custom-made shoes, The Foot Lab can help. We cast, measure, scan and photograph your feet to create a 3D computer model before sending it to our top-notch manufacturing facility. There, skilled craftsmen build your shoes to exact measurements, so you get the most accurate fit possible. Once your shoes are complete, we quality check each one to make sure everything came out exactly right. Your new custom-made orthopedic shoes can be ready in just 4-6 weeks. If you have foot, leg, or back pain or discomfort, custom-made orthopedic shoes can make a world of difference in your daily life. A custom orthopedic shoe is built by hand for your specific needs, including the way you stand and walk, providing relief from chronic health conditions like cerebral palsy, diabetes or a partial foot amputation. Footwear plays a critical part in how we move. Poorly fitting shoes can even cause long-term pain problems. Imagine a pair of shoes or boots that fits you perfectly the moment you try them on. If you’ve had trouble finding properly-fitting shoes at traditional stores because you have hard-to-fit feet, make an investment in your comfort with a pair of made-to-measure, custom shoes. The Foot Lab makes sure your shoes fit exactly as they should, whether you have very large, small, narrow, or wide feet, and even in the presence of a bump or other non-typical foot shape. Your shoes or boots fit much more comfortably with a custom-made insert or insole. A custom-fit insert or insole reduces strain on your body caused by walking or standing, improving your joint and muscle health. At The Foot Lab, we start with a full analysis of your gait – the way you walk and move. From there, we make a cast of your feet and get to work creating the right foot orthotic for you. Made in-house by pedorthic master craftsman Tom Lemke, your inserts or insoles can be ready in just a week. When your leg lengths or foot shapes don’t match, off-the-shelf footwear is uncomfortable and impractical. You might walk with a limp or have persistent pain in your feet, legs or back. The Foot Lab can change your existing shoes to accommodate differently-sized legs or feet. For differently-sized feet, we gently stretch your off-the-shelf shoes to fit. If your legs are different lengths, we add a larger sole to your existing shoe on the shorter side, giving you a more natural walk with less impact with less strain on your body. It all starts with a full assessment of the way you walk, stand and move. The Foot Lab works with AADL, WCB, (F)NIHB, private medical insurance companies, doctors and specialists to make your custom orthopedic footwear, insoles, inserts and custom-made shoes. AADL covers 75% or 100% dependent on your financial situation, A prescription from your doctor or podiatrist is required for coverage. NIHB covers 100% if the footwear is approved. A prescription from a surgical specialist is required for coverage. WCB covers 100% if you have prior approval from WCB. Private health insurance covers custom made orthopedic footwear. In most cases the coverage is sufficient to cover the 25% not covered by AADL; be sure to check your policy. Like AADL, private health insurance requires a prescription from your doctor or podiatrist for coverage. Located in the Meadowlark Place Professional Centre, we have been making custom footwear for Canadians for over 30 years. Our Pedorthist will cast, measure, scan and photograph your feet to create a 3D computer model from which we can build your custom-made shoes to exact measurements. Our custom orthopedic shoe is built by hand for your specific needs, including the way you stand and walk, providing relief from chronic health conditions like cerebral palsy, diabetes or a partial foot amputation. As one of only six Certified Pedorthic Master Craftsman in North America, Tom Lemke has been making custom footwear for Canadians for over 30 years. In addition to the coveted CPMC designation, Tom is also a Certified Orthopaedic Footwear Specialist and a Certified Pedorthist. As a Pedorthist,Tom is a specialist in manufacturing, fitting and modifying foot appliances such as braces, shoes, boots and all types of customer footwear. In 2003, Tom founded his own orthopedic, orthotic and pedorthic practice: The Foot Lab in Edmonton, AB. Tom has a passion for designing and making custom orthopedic footwear to help his customers walk more comfortably. He is especially proud of his work to serve the customer footwear needs of Canadian Military personnel. Bare Foot Running! Yes Or No? What are your thoughts on bare foot running? What are bunions and how can I prevent in getting them? What are the top 5 causes of sore feet? What foot, ankle and heel problems can orthopedic footwear focus on? How do I prepare my feet for a 12-hour manual labor work shift? Whom do I see for my foot problem that needs specialized orthotics? Why do older people have more foot problems? Does everyone have foot issues? Simple exercises I can do for good foot health? How many bones are in the feet? Can I get orthotics for ice skates? Will not wearing my orthotics damage my feet? What running shoes do I buy my child for track and field? Will orthotics help my 3 year old walk better? What is involved with getting fitted for foot orthotics? Can orthotics help with my Plantar Fasciitis and Heel Spurs? Is it possible to fix a high arch or flat feet with orthotics? Modifying Your Shoes To Fit You! Do Custom Insoles Really Work?